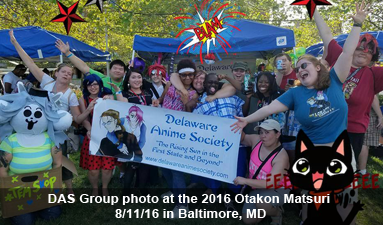 Welcome to the Delaware Anime Society webpage! We here at the DAS thank you for stopping by and hope that you enjoy your visit and maybe even join us. For more information on the club hang out here and explore. For more specific information join our Yahoo group, or our Facebook Group, take a peek at our Events and/or check out the chapter webpages. We have a North DE Chapter in Wilmington, a South DE Chapter in Dover and a S.E. Pennsylvania Chapter in Bryn Mawr, PA. Since 2006, our page has had this many hits!